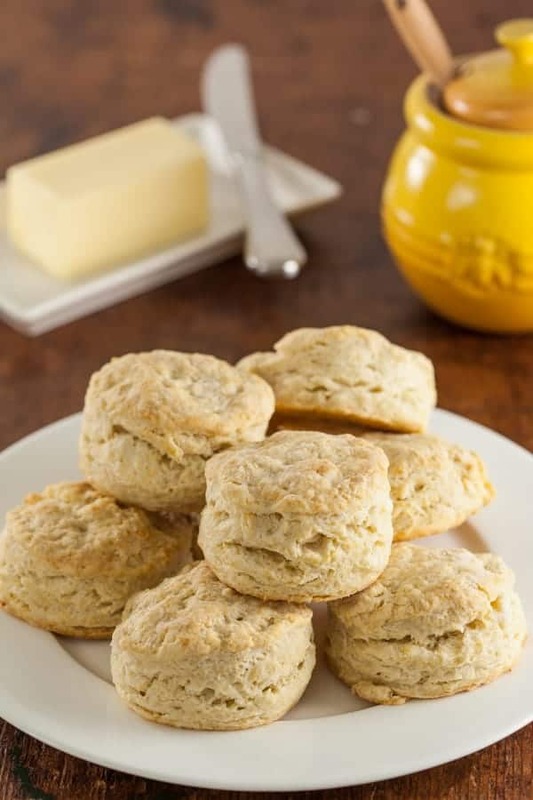 Sourdough Biscuits Recipe - Quick, Easy, and Buttery! These quick, easy, and buttery sourdough biscuits are the perfect way to use up some sourdough discard when feeding your sourdough starter. They can be mixed, baked, and on the dinner or breakfast table in less than 30 minutes! 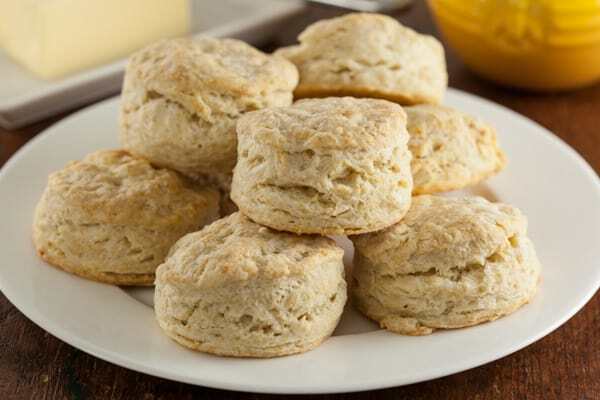 Sourdough biscuits are even more flavorful than traditional buttermilk biscuits and they are just as easy to make as long as you have a sourdough starter hanging out in your refrigerator. 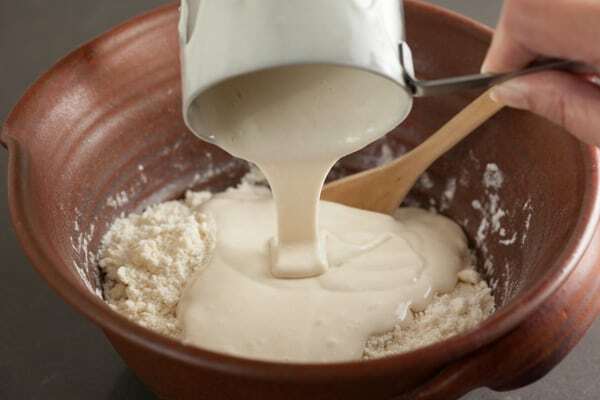 Even if you don’t have the time or inclination to make sourdough bread from scratch, a sourdough starter is the secret to the most delicious pancakes, waffles, and biscuits you’ll ever taste! Sourdough starter can also be used in desserts like my easy Pumpkin Maple Sourdough Cake or rich and decadent Sourdough Chocolate Cake with Cream Cheese Frosting. I’ve also experimented with adding it to quick breads like my favorite sourdough banana bread. So many possibilities! Although it takes a bit of time to make a sourdough starter from scratch, it’s easy to do. 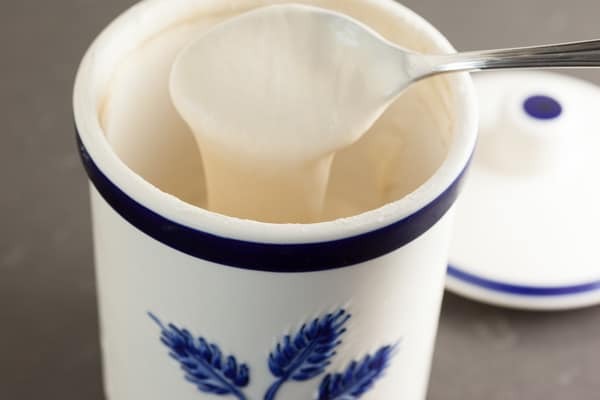 And once you have a sourdough starter going, you can keep it for a lifetime or even longer if your family decides to carry on the tradition – how cool is that!? I also think that creating a sourdough starter could be a really fun and educational science project to do with kids. I’m really looking forward to sharing these things with my daughter when she is old enough. I will be sharing easy everyday sourdough recipes here on the blog on Sundays. We love to eat sourdough biscuits or sourdough waffles on Sunday mornings so I thought it would be fun to start a Sourdough Sunday series to share these easy and delicious recipes with all of you. Next, you’ll find lots of step-by-step photos to show you just how easy it is to make these biscuits from scratch. If you’d prefer to jump straight to the printable recipe, just scroll to the very bottom of the post. Enjoy! In addition to the sourdough starter, you’ll need just a handful of everyday pantry items to make these biscuits. 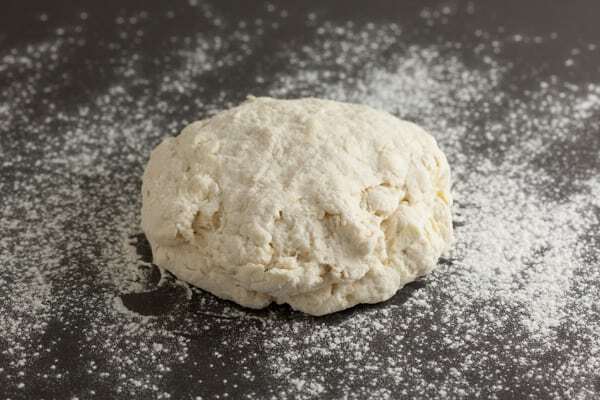 Start with one cup of flour – either all purpose or a mixture of half all purpose and half cake flour for an extra light biscuit. 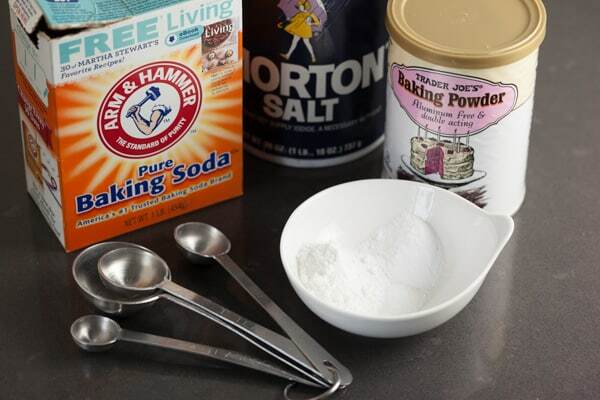 Measure out some baking powder, baking soda, and salt. You can use whatever type of salt you happen to keep on hand, just make sure to read the recipe notes for a tip on using the correct amount of salt if you prefer kosher or fine grain sea salt. 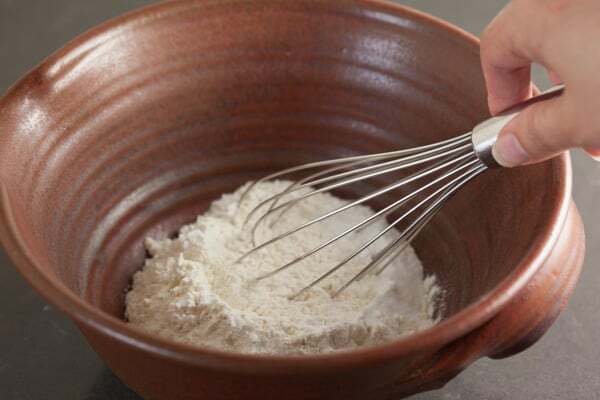 To keep things simple, I use a whisk to combine the flour, baking powder, baking soda, and salt. But you can also run everything through a sifter or sieve a couple times to make sure it’s well blended. Next, add some very cold butter that you’ve chopped up in advance. 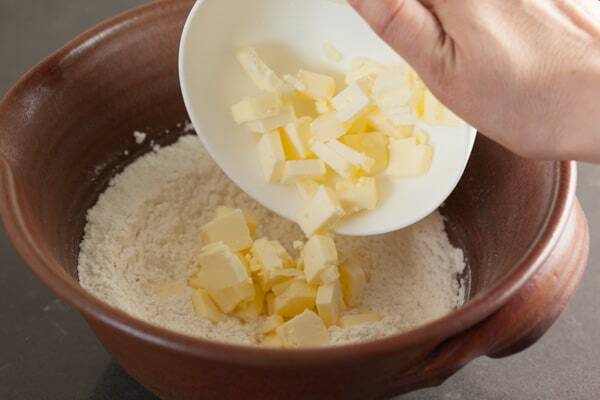 Blend the butter into the flour mixture using a pastry blender or your fingertips. I like to use a combination of both methods. Just work as quickly as you can so the butter stays cold. This is what the flour and butter should look like when it’s blended enough. It will look like a mixture of coarse crumbs with little chunks of butter about the size of peas mixed in. 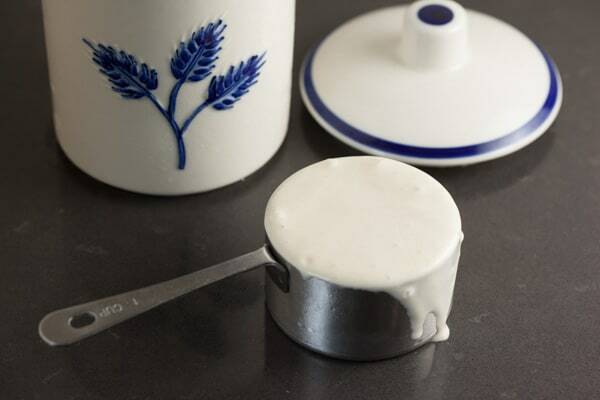 Measure out a cup of unfed sourdough starter straight from the fridge. Add the starter the to the flour and butter mixture. 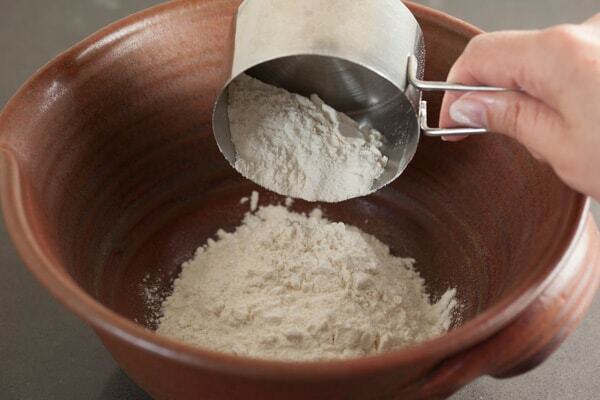 One cup of sourdough starter equals about a cup of flour plus half a cup of water. So half the flour in the recipe was blended with the butter and the other half is delivered in the sourdough starter. Does that make sense? 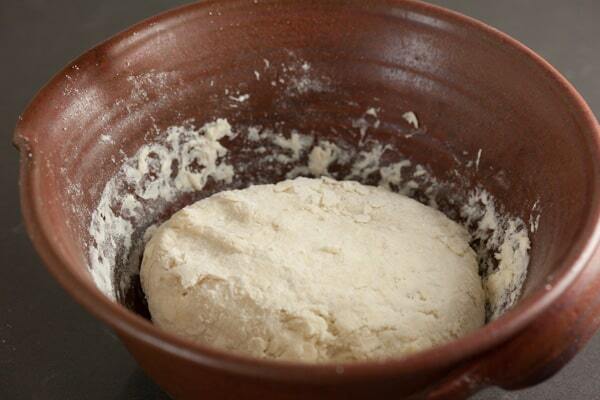 The water in the starter is the only liquid we’ll need to bring the dough together. There’s no need for buttermilk because the sourdough starter is acidic and works just like buttermilk to react with the baking soda. And I think it adds just as much flavor as buttermilk, if not more! Mix everything together with a big spoon. If your starter has been fed more recently and is thicker than mine, it might be a little more difficult to combine everything with a spoon. In that case, just jump in with clean hands and quickly mix everything together. Mix until the dough just comes together and most of the flour has been absorbed. Since sourdough baking isn’t an exact science, feel free to add just a splash more liquid if the dough seems way too dry (anything will do – water, milk, buttermilk) and if it’s way too wet and sticky, just add a bit more flour. 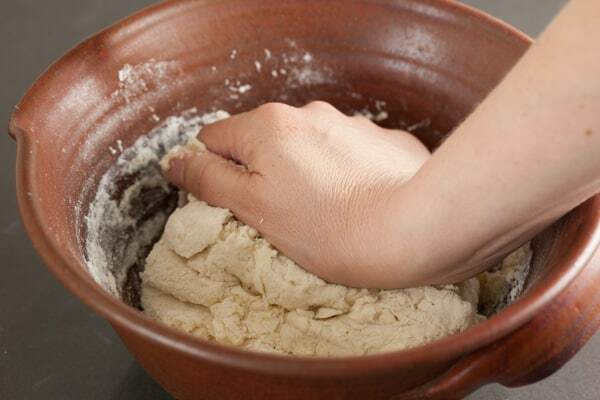 Knead the dough in the bowl a couple times just to finish bringing everything together. 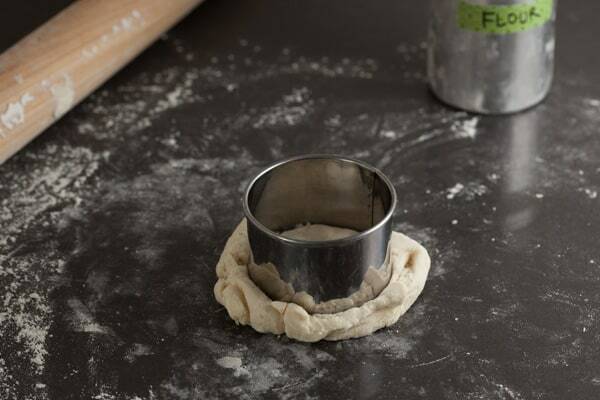 Now dump the dough out onto a lightly floured work surface. 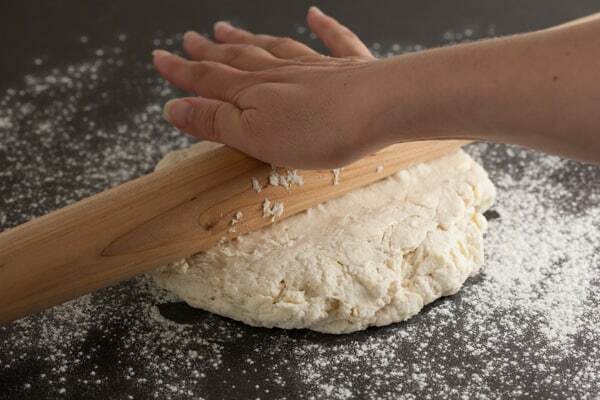 You can either roll or pat the dough out into a circle that is about 3/4-inch thick. If the dough is too sticky, sprinkle just a bit more flour on top and underneath. 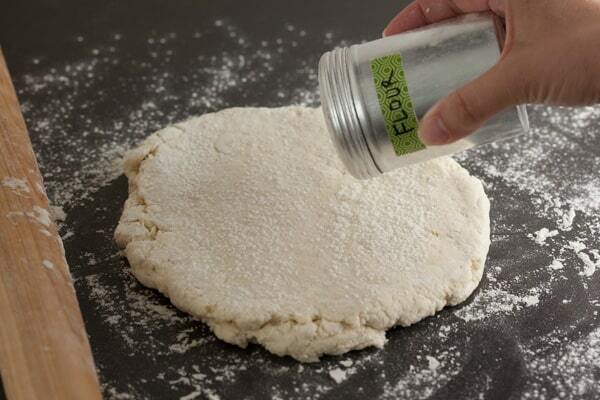 I love keeping a little shaker container filled with all purpose flour in my pantry. It works perfectly and I use it all the time for baking bread, making pie crusts, biscuits, and scones. Some containers come with lids, but I just keep mine in a plastic bag to keep the weevils away! I also use these containers for powdered sugar and homemade spice blends or rubs. So handy and inexpensive! Next, cut your biscuits. For these I used a biscuit cutter that was close to 3 inches wide. If you don’t have a biscuit cutter, you can use a glass. Or, if you don’t care about round biscuits, I’m going to let you in on my favorite tip. 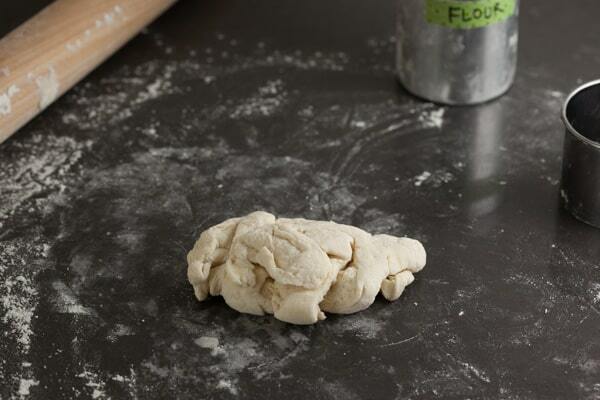 Instead of rolling the dough into a circle, make it a rectangle. Cut the rectangle into 8 equal squares and you’re done! No worrying about re-rolling scraps. But if you are cutting round biscuits, you’ll have scraps to deal with. To avoid a really tough biscuit, just gently combine the scraps without working the dough too much. Pat it down to the same thickness as before. Then cut your last biscuit. the last of the scraps and just be hand formed into what I call the ugly biscuit. I eat the ugly biscuit as soon as it comes out of the oven. It’s the baker’s reward for getting up in the morning and making biscuits from scratch! See the ugly biscuit up in the top right? Notice how the ugly biscuit is now gone? Delicious! 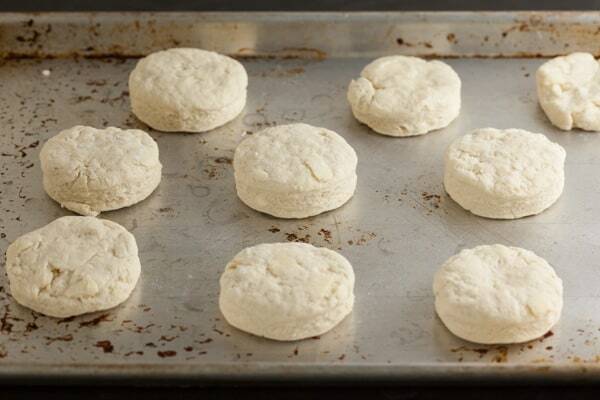 These biscuits bake up in about 12 to 15 minutes. While they’re baking, you could always make some sausage gravy and a side of scrambled eggs, which is my husband’s favorite breakfast. 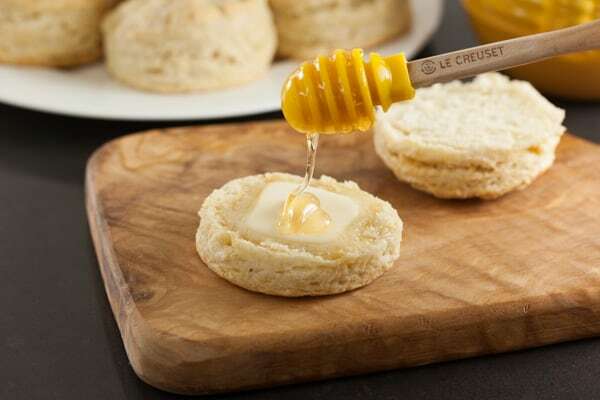 Or if you’re like me, you could just eat the biscuits with lots of butter and honey. Whether it’s for breakfast, dinner, or an afternoon snack, I hope you give these biscuits a try soon. If you don’t yet haven a sourdough starter, you should begin here. 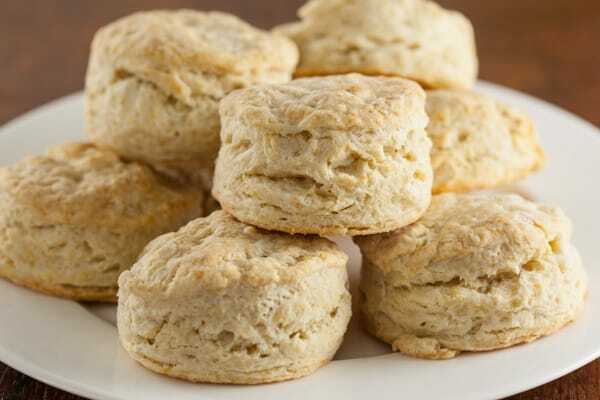 If you’d prefer to make the best buttermilk biscuits from scratch, I have a great tutorial for that as well. 2. 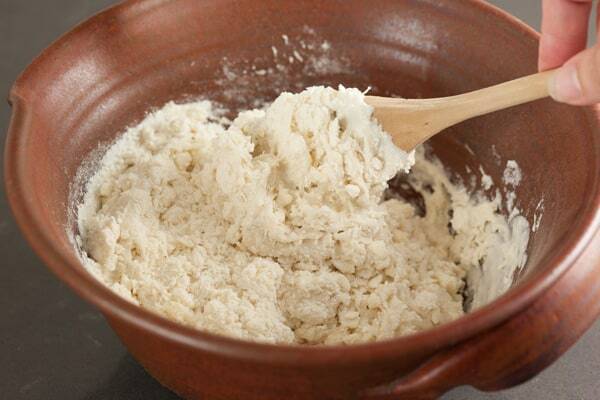 Sift or whisk together well the flour, salt, baking soda, and baking powder. 3. 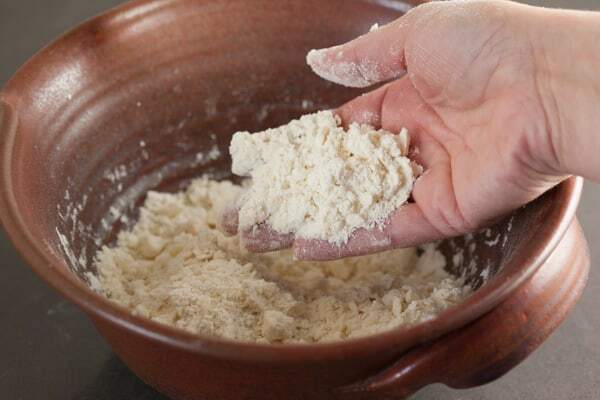 Cut the butter into the flour using a pastry blender or your fingertips until the mixture looks like coarse crumbs with pieces of butter about the size of peas. 4. Add the sourdough starter and mix with a spoon until most of the flour is incorporated. 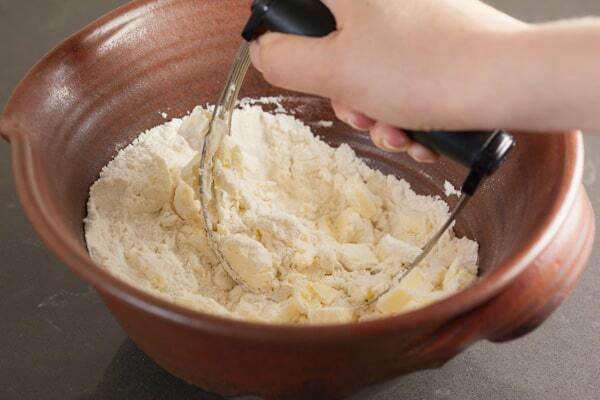 Knead the mixture in the bowl a few times until it comes together. 5. 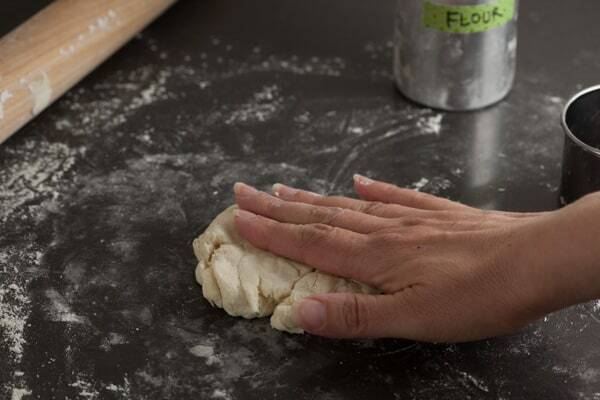 Turn out dough onto a lightly floured work surface then roll or pat the dough out to about 3/4" thick. 6. Cut biscuits, gather scraps, re-roll and cut out one or two more. 7. 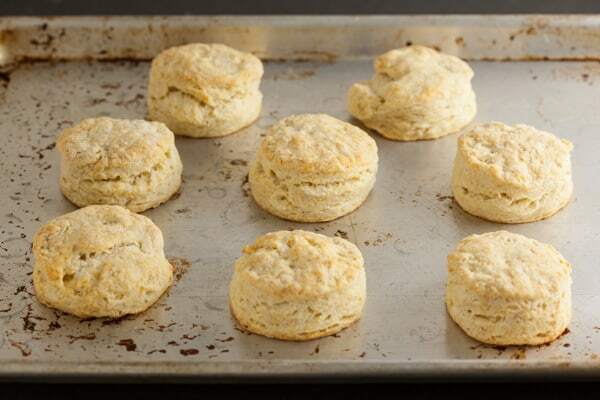 Place biscuits on an ungreased baking sheet. Place them close together, touching, if you want soft-sided biscuits or space them apart for crisper sides. 8. Bake at 425 degrees F for 12-15 minutes, until browning around the edges. If you placed biscuits close together, they will take longer than if they are spaced apart. 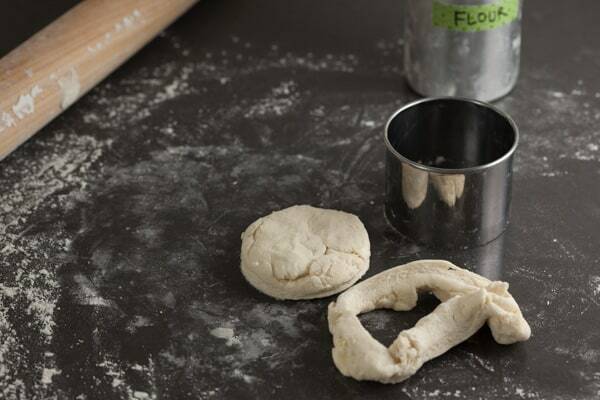 You can either use all purpose flour or half all purpose and half cake flour for a lighter biscuit. If using regular table salt or fine sea salt, use a scant half teaspoon of salt. If using Diamond Crystal kosher salt, use a full teaspoon. If you want to use salted butter, reduce the salt in the recipe by half. Thank you for sharing a link to my whole wheat sourdough-starter biscuits recipe. So kind! This week at our house we're enjoying strawberry-coconut scones made much as you describe. Your biscuits look absolutely fabulous! @Kathryn Grace - Strawberry Coconut Scones sound wonderful! I was just telling my husband I need to make some fruity scones soon with sourdough discard. Yum! Just happened to have extra sourdough starter (not the "mother" which was separate, but one of her sweet leftover kids! I was feeding the "kid" out of the frig, looking for something new. When I saw your easy puffy biscuit recipe, knew I had to make it NOW. Despite your details, my eagerness missed critical info. The sourdough starter needs to be COLD, and when rough grating butter stick into mix, it should be slightly frozen. I was a little short on the starter by 3 tablespoons and didn't check your pic as to how moist dough should be and mine was a but dry. 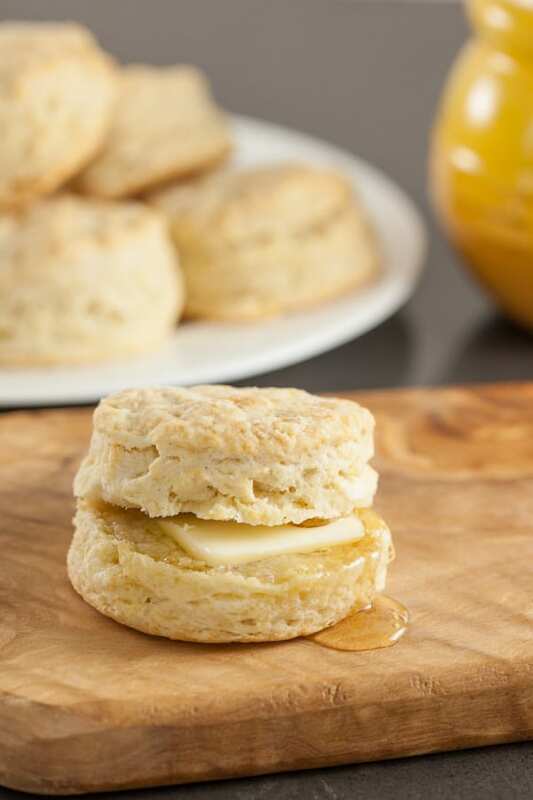 BUT, you know what ... these flawed biscuits sure are tasty and tried one half with almond butter and the other side with a dollop of Meyer Lemon Curd and mighty yummy! Please tell me if Cake Flour for half flour will make these high like yours? Can these baked biscuits be frozen, then defrosted and warmed in toaster oven? Thanks so much for the freshly updated Pinch My Salt... found you on Yummly. Hi Gina,Yes, the cake flour does make a difference in the rise for me, as well as how thick you roll the dough. 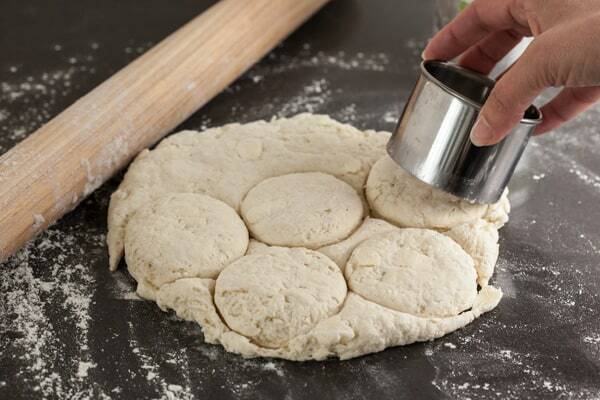 Make sure it's somewhere between 3/4"–1" thick for taller biscuits. I haven't tried freezing them but I do heat leftover biscuits that are a day or two old in the oven and they still taste pretty good, so I'm sure freezing them would be fine. I think all biscuits taste best fresh out of the oven though! :-) If your dough is too dry, just stir in a bit of extra milk or buttermilk. Thanks so much for stopping by! Just made these tonight. They were better than the recipe I've used for years! I'm new to sourdough and this was my first attempt at biscuits. I'm so glad I started with yours. These were AMAZING. I only had a whole-wheat starter so that's what I used and they were still so light and fluffy! This is definitely a keeper. I've never had such flaky, perfect biscuits. My dough was a bit dry (I think because my starter was a bit more dough-y than yours from the pictures) but I added a splash of cold water and they came together perfectly.Thank you for sharing! These biscuits are so good! My husband was so impressed! I also made a sausage gravy & scrambled eggs. Seriously, my husband said this was his favorite meal EVER! I love this recipe and I admit to doing some serious tweaking to the method. At night I mix 1 cup starter with 1 cup ap flour, cover and let sit overnight. 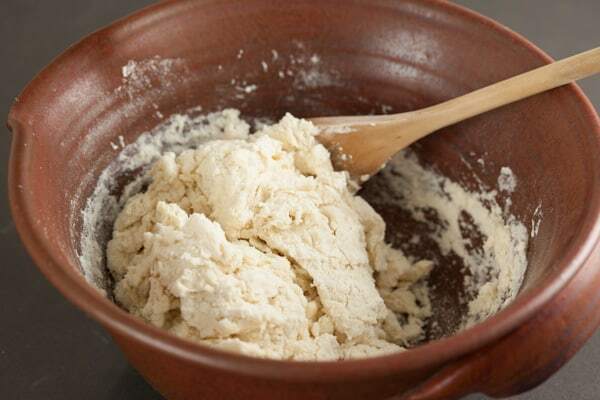 The next morning I add 1 more cup flour, the baking soda, powder and salt...leave out the butter and add the buttermilk to biscuit consistency. Pat out to a 10 x 12 rectangle and grate cold butter directly on top. Letter fold, turn and fold again 2 or 3 times patting out between each fold chill 1/2 hour and repeat. Pat out smear with one stick of soft butter heavily sprinkle with brown sugar and cinnamon. Chill 10 min and roll up jelly roll fashion. Cut with dental floss in 2 1/2 inch slices, place on parchment line cookie sheet and press down to flatten. Allow to rise for 1/2 hour and freeze. When frozen, bag in a zip lock. When you want to bake, preheat oven to 450, place on a parchment or foil lined pan and bake 20 - 25 minutes. Baking a full batch of anything for just my husband and myself is a waste, this way I can bake 1 or 2 at a time. They also make a great thoughtful gift for other empty nesters or busy moms. Wow! Great ideas! l'll be using these. Would I be able to let the dough ferment overnight to get the true sourdough effect, and still add butter in and experience a flaky, fluffy biscuit? I have made these countless times and they are a hit! Fantastic and Yummy, Strawberry Coconut Scones sound wonderful! I was just telling my husband I need to make some fruity scones soon with sourdough discard. These were great! I made a triple batch last night for my church home Bible study group and they loved them. I appreciate your great directions. I am posting this link on our private FB page for my friends. They want the recipe. I want them to see the techniques you use. They were asking how the flakiness happened. I do this all of the time! I mix the flour and starter the day before along with the salt and a bit of water if needed. I also add a bit of maple syrup for sweetness but that's optional. I let it ferment for up to 24 hours. When ready, I mix in by hand the baking soda, baking powder, and butter. Sometimes I have to add a smidge more flour if it's too wet but at least the majority of the dough has been fermented. Then I just form and bake as usual. They are so good!